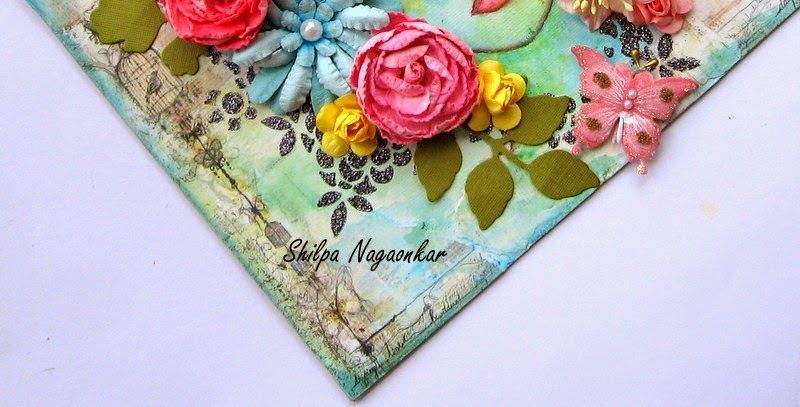 Today we have a beautiful canvas tutorial by Shilpa. 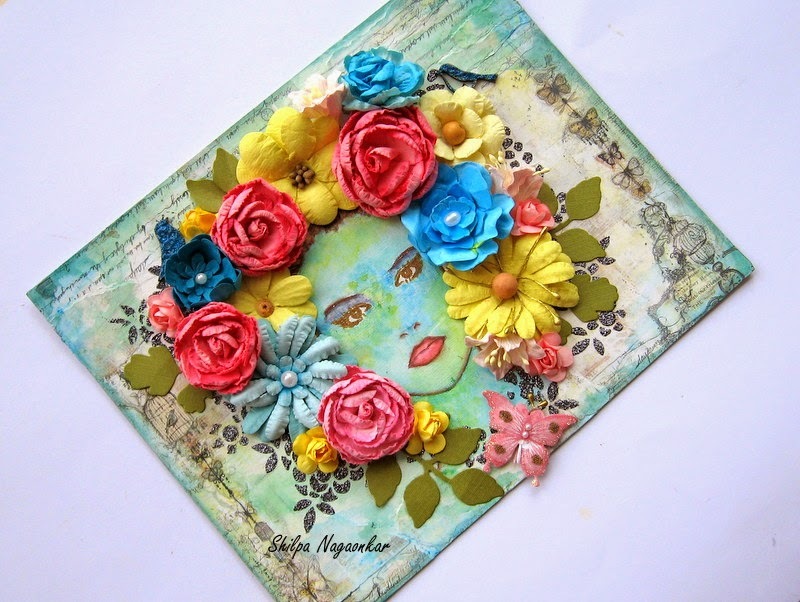 This is Shilpa's first tutorial and we are looking forward to seeing more of her fabulous creations. We hope you will welcome Shilpa to the team. 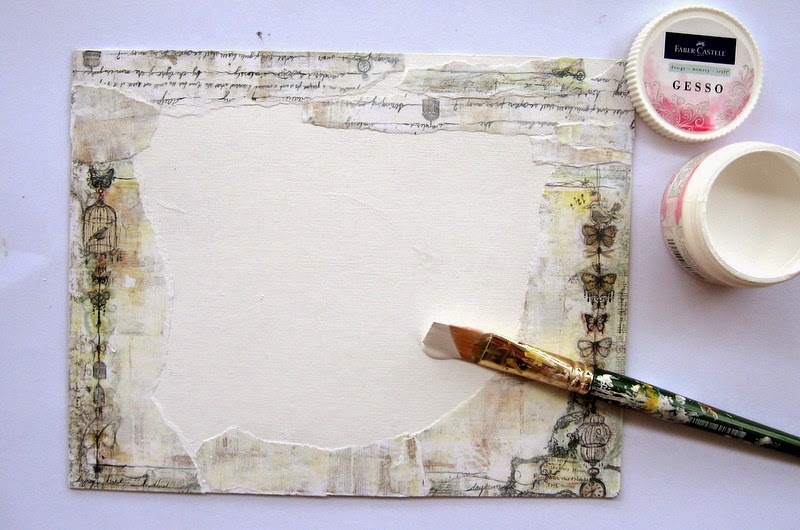 Attach design papers to the edges of thick white chipboard randomly. 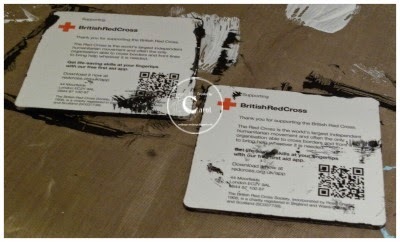 Apply a thin layer of Gesso and leave to dry. 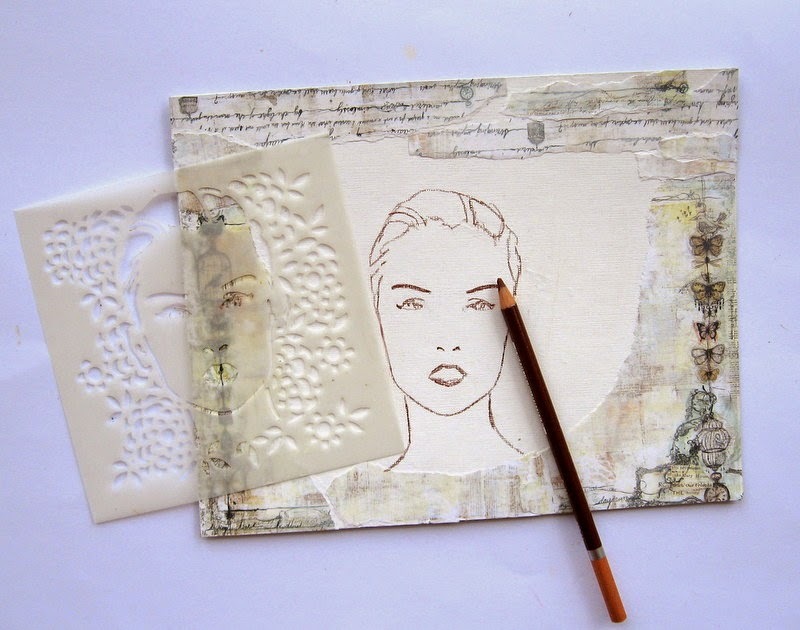 Place the Beautiful Blossom stencil and use a brown watercolour pencil trace the face of the image. Using watercolour inks colour the image. 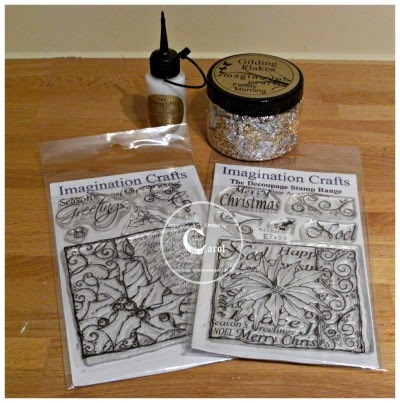 Once image is dry place the beautiful blossom stencil back over the image and stencil the blossom with Gunmetal Sparkle Medium. Using watercolour ink add colour around the design papers. Once everything is dry decide on the colours you wish to use for your embellishments. 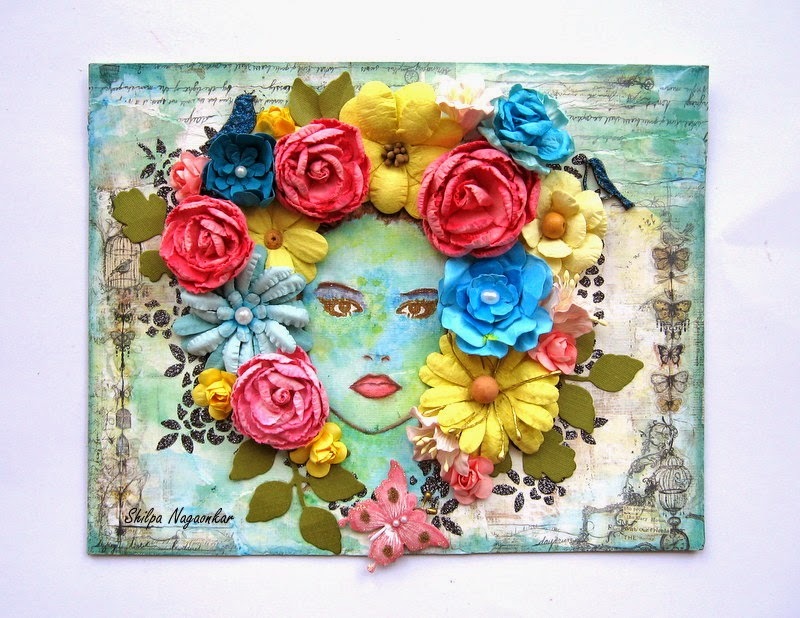 An array of assorted flowers, die cut leaves, butterflies and birds have been used. The finished project. Don't you think this is gorgeous, I know I do! Labels: Beautiful Blossom Stencil, Imagination Crafts, Sparkle Medium. Today we have one of our new design team member's Carol sharing her tutorial with us. Welcome to the team Carol, we hope that you enjoy your time with us. 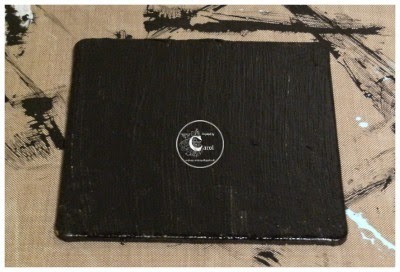 Started with two coasters which came free in a charity envelope, coated both sides with black gesso, then when dry a further coat of chalkboard paint. 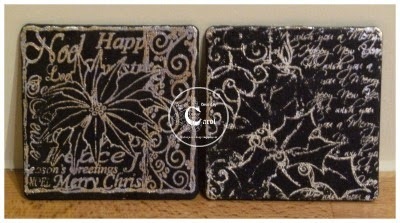 Image stamps were then inked up with gilding glue, stamped onto the coasters and allowed to go tacky. 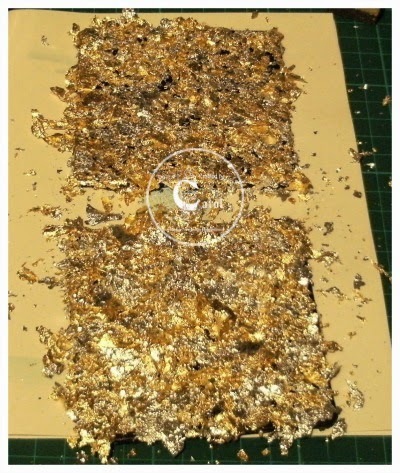 Gilding flakes were then added. Once dry the excess flakes were then brushed off.